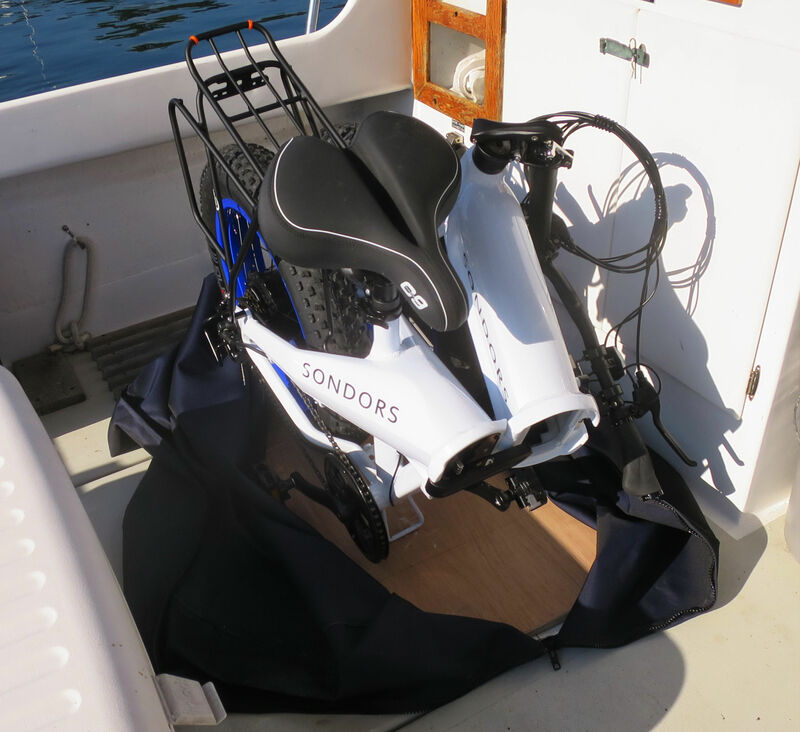 Just before heading south last September, I received the Sondors Fold X7 above, and after about fifteen weeks of roundtrip and onboard marina time, I had been assisted in pedaling 499 miles, almost all of them memorable. For instance, while I had often enjoyed Reedville before, I had never wandered far from the village, let alone the marvelous 20-mile meander tracked on that screenshot. The story was similar in Hampton, Chesapeake, Coinjock, Belhaven, Oriental, and New Bern, though peak fun may have been the beach and boardwalk rides in Atlantic City, or being the oddball who attended his 50th college reunion by fat tire ebike. I also used the Fold X to commute 9 miles from a friend’s dock to the Annapolis Boat Shows (with easy close parking), and I fit at least 70 pounds of groceries into those rack packs on multiple occasions. In short, the concept proved out. 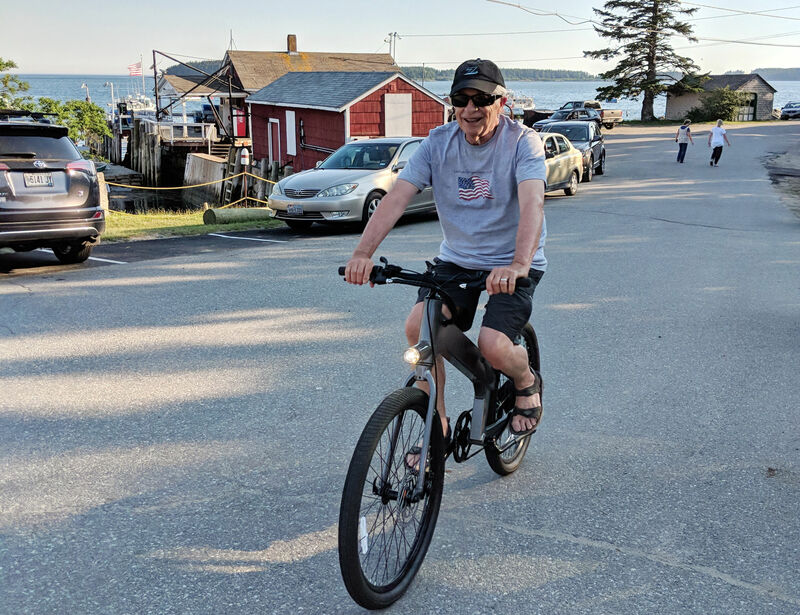 With a good ebike, I had range and load capacity simply not possible on a regular boat bike, especially with my level of fitness and osteoarthritis (5’10”, 200 pounds, not lean, one hip replaced, and the other acting up). Add to that a fun factor that has me riding almost every day possible, and on the lookout for copacetic cruising stops. But what about the dangers of salt air and water corrosion, now with a complex power and control system on top of the many regular bike components? Well, I had Gemini Canvas built this custom “bag” and while it may be overkill, the Fold X returned to Maine in excellent health. I supplied the bag’s lightweight plywood floor and asked for an extra loose fit with a floor-to-floor zipper and a retaining strap able to cinch the bag tight along the zipper line and also provide attachment points if the packed bike needed to be tied down in Gizmo’s aft cockpit. I had planned to add wood chocks to position the folded bike just so, but they weren’t necessary. The packed bike not only stayed put (sometimes cleated off in a seaway), but was moderately easy to heave onto the rail and then down to a floating dock, or even slide out onto the swim platform and into the tender. So here’s how the bike got ashore in Reedville, the last move featuring yours truly standing on the fixed dock hauling the bag up out of Gadget with a rope. The Fold X set up as shown weighs 70 pounds and though I can separately manage 16 of those by putting the seat and battery into the snap-off panniers, moving that big bag can get comical in some scenarios, even painful. Weight is the main reason I’m onto a new boat bike, detailed below. But I must add that the Fold X has now become my main ride, the ebike that’s in the garage ready for daily errands, commuting to the harbor, or adventures. All that weight feels great when rolling, as do the 18 psi fat tires, and that’s mainly because efficiency is not a significant factor even in my hilly area when 7 gears, a 500-watt motor, and a 48v 14.4ah battery assist. In fact, I recently made it almost all the way around a steep and stony mountain bike trail without falling down, though that would have been a better decision for a fitter man. Scary, right? Sometimes things do go wrong with ebike systems, which means that technical support and parts availability should certainly be factors in a purchasing decision, especially until more local bike shops go electric. But that said, I’ve had few problems so far. It was at home that I managed to plug the wrong charger into the Fold X and blow its 5a charging circuit fuse, though that wasn’t obvious at first. Sondors customer support has gotten much better since I bought the Original model in 2016, but so has the Facebook Sondors Owners Group. I quickly learned that the Fold X battery uses a separate charging fuse and how to access it, with photos. And in this case, I got to give back, as owners with the same issue were soldering in new blade fuses, as manufactured. 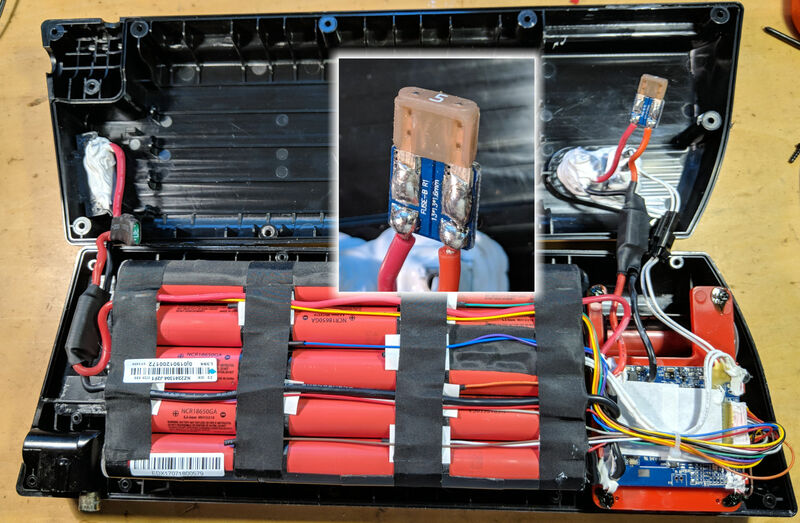 I replaced the little circuit board with a standard blade fuse holder, tested it thoroughly, and added my comments and photos to the community knowledge bank. Given my positive Sondors experiences along with the desire for a lighter folding boat ebike, I purchased this Fold Sport when it was announced for pre-sale at the end of March. 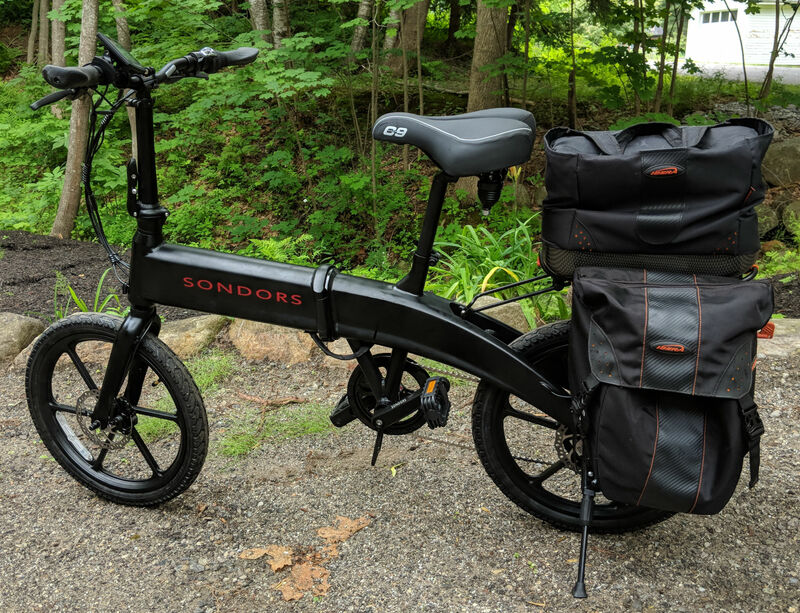 Sondors keeps its pricing down by selling new models prior to manufacturing in China, and unfortunately any extra Sports they had built are sold out. 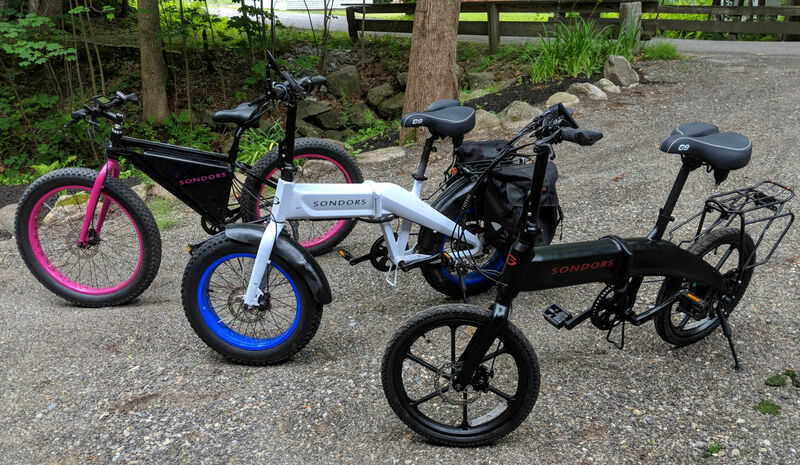 Hopefully they’ll be back in stock soon, along with the even smaller Fold Mini, and note that the currently available Sondors Fold is lighter than my Fold X (and will likely serve fine in flatter coastal areas even with its smaller battery/motor and single gear). 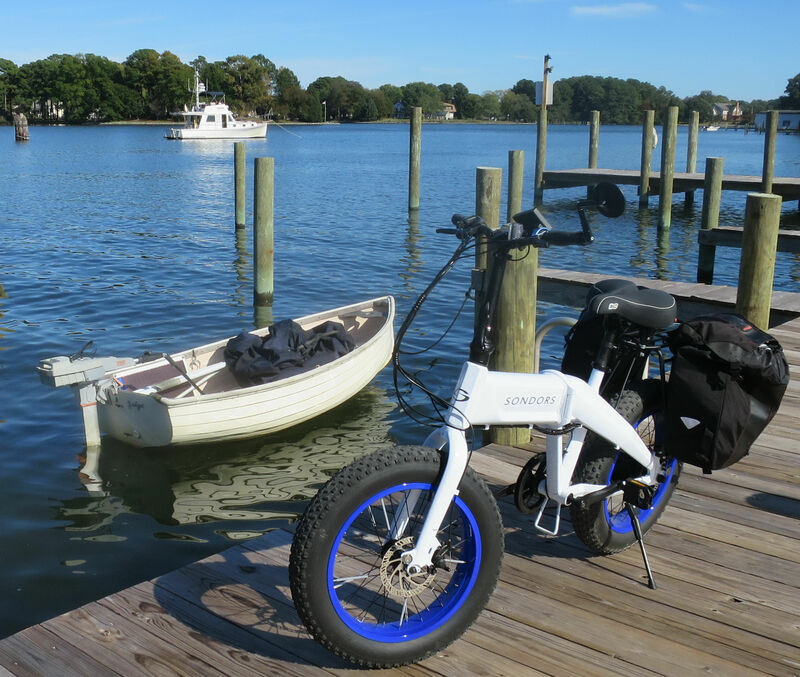 But if you’re patient, I think the Fold Sport — 58 pounds as set up above, 49 without battery, seat, and bags — is an excellent boat ebike at $849 delivered. The ride is softer than I expected with those 2-inch tires (though I did immediately replace the stock seat with that cushy Cloud 9 Cruiser Gel Sofa) and it’s surprisingly sporty given the 36v/350w power package. Smaller wheels mean more torque, and the six gears make pedal assist much more effective on hills. The Sport’s aluminum wheels and stainless chain are also a plus for boat use, and I was tickled that it took the Ibera PakRak RA5 and Quick-Release Pannier system I’ve gotten very fond of. Yes, you can easily take them into a grocery store — the Ibera Insulated Cooler Bag, too — and then down the dock when you get back. But I’ll use them cautiously, at least at first, as the Sport is rated for a max load of 242 pounds while the plain Fold and X models are purportedly tested to 300 pounds max. 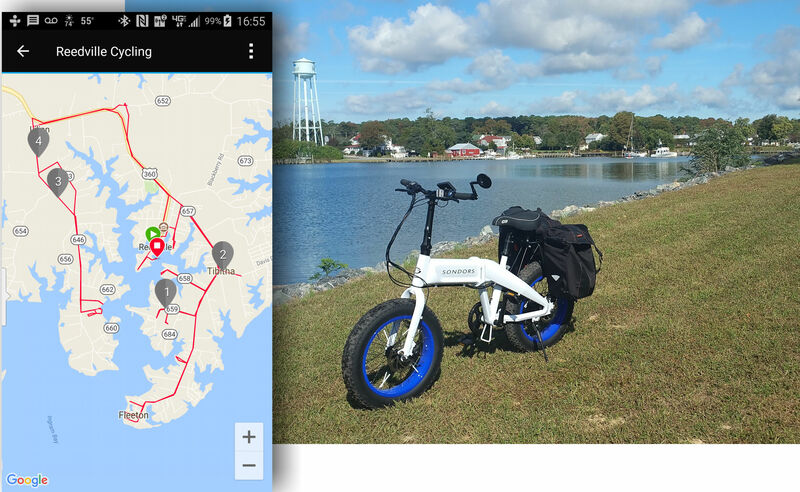 So what about the other two ebikes in my fleet? Well, obviously I have a problem, but I’ve learned more worth sharing (I think). 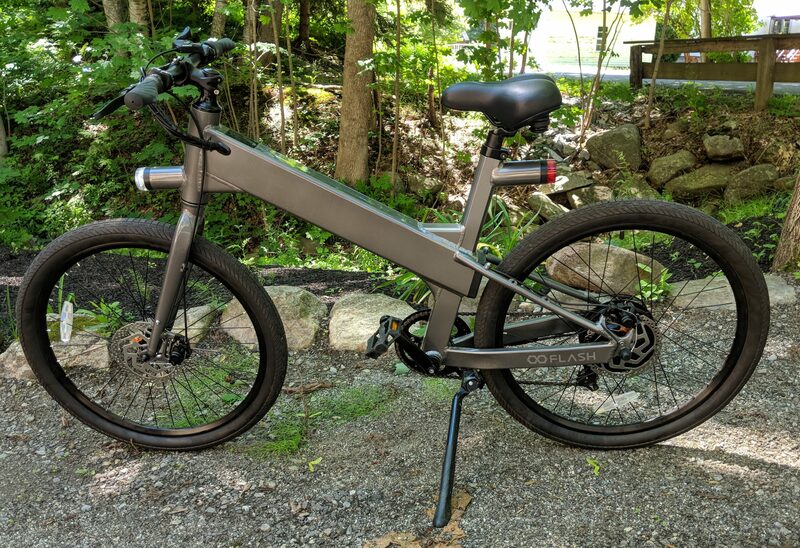 Buying products by backing them on a crowdfunding site like Indiegogo is definitely risky, but that’s how I came to own this very interesting Flash V1 ebike at well below its current price. It was actually delivered ahead of schedule and, more important, all the unique safety and security features work as promised. I am very aware that a bad fall or collision could instantly reverse all my accumulated ebike fun, and I don’t trust humans in motor vehicles. So I almost always operate with a flashing red taillight and often with a flashing white headlight (as well a rear view mirror, high viz helmet, and careful routing). But the Flash V1 takes ebike lighting to another level, a level all ebike manufacturers should aspire to, I think. Flash offers good from-the street lighting videos, but let’s look at the rider view of the very clean V1 control system. While the 360° flashing running lights come on when you turn on the bike — unless you’ve disabled that feature with the Bluetooth Flash app — that three button cluster between the shifter and the twist throttle lets you activate three levels of headlight and the right turn signal (as well as the 85 decibel horn). Meanwhile, the three button cluster at left controls the left turn signal along with the V1’s five levels of pedal assist. But the cherry on top that Flash hardly advertises is how the V1’s little touchscreen indicates lighting status, and even beeps when the turn signal is left on, like a car. This bike also has brake lights, and all lights and horn are powered from the main battery, which you’d think would be true of many ebikes, but is not. The touchscreen is also home to the Flash V1’s security system, which includes a GPS and lifetime T-Mobile service able to notify you of a stolen Flash’s location. Actually, if you’ve armed the Flash with the touchscreen or app and someone moves it a few feet, the first level of security is flashing lights and an increasingly loud horn. If the thief doesn’t give up, you’ll start getting alarm notifications on your phone along with the location app screen seen above. 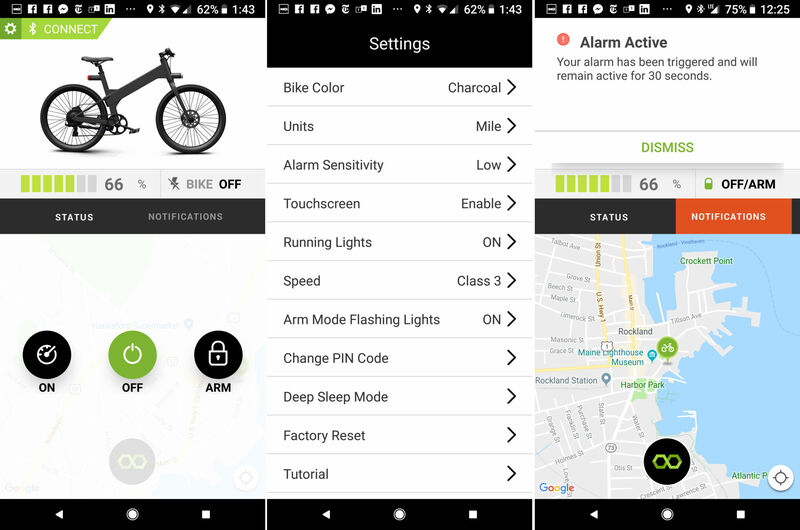 You can also check the battery and arm the bike via cellular if you’re beyond Bluetooth reach, though I’ve only tested these features briefly because there is only a little local T-Mobile coverage (in nearby Rockland). That’s one reason I’m selling my Flash V1; I also have too ebikes many already, I’m told, plus an impulsive and curious eye on the many new ones coming out. 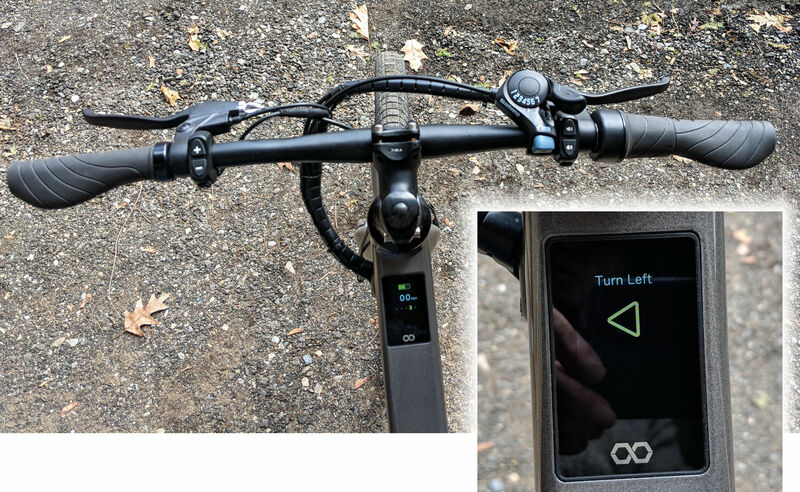 But the Flash V1 is proof positive that excellent safety, security, and connectivity can be tightly integrated into ebikes, and hopefully will be on many designs to come. This “Three Olives” folding 16-inch wheel ebike illustrates another concept altogether. Ebikes are still unusual in the U.S., but sales are huge in China, and thus many components are very competitively mass produced. Which likely explains why a British vodka company gave away a mess of fairly decent ebikes in a marketing campaign, and I ‘m the third owner of a nearly unused one at a price close to the cost of replacing that 36v Silver Fish style battery. I did have to find a charger with the correct plug, and I’ve yet to positively identify the actual manufacturer, but there are many similar bikes out there under various brand names and I’ve learned enough to know that the components and bountiful accessories are medium quality. This would make a pretty good ebike for a smaller person, I think. It also indicates that the well informed can find ebike deals, though I suspect that there is also some cheap junk in the market that could cause endless headaches. Actually I’m surprised that there are no marine stores carrying some foldable bikes or scooters. I need to go for regular e-bike stores for that stuff. Or am I mistaken? I met a guy with an Urb-E style escooter in Atlantic City and it looked fun for getting around that relatively flat city. But he wasn’t taking in on the plank boardwalk, and certainly not the beach, which were both highlights for me with the 20 x 4 inch fat tires. Also, I’m pretty certain that no e-anything with a 350 watt motor will get up much of hill with a 200 pound rider like me but without pedal assistance. And range is deeply contingent on battery size (not listed by Urb-E), rider weight, amount and grade of uphill, and amount of pedal assistance. Manufacturer stated ranges are not to be trusted. The “entire purpose” of a bike is not exercise. That is an entirely first world privileged point of view. I too use ebikes (actually electric scooters) from my boat and its entire purpose is transportation. It takes me to the grocery, the laundry, the restaurant and anyplace else I want to go. I do not want to exercise on the way to dinner, I want to arrive relatively sweat and odor free. I exercise on my SUP. Buy the way I think the author needs to look and the electric scooters instead of the ebike. No pedals at all. I do not agree with the previous comment. For those of us who enjoy the outdoors ,but are not physically able to enjoy it to the fullest, E-bikes are a perfect way to get a little exercise and still have the enjoyment of the outdoors. As far as not getting any exercise on a sail boat obviously you only sail on calm water. Happy sailing. Interesting article. I wonder if the author has looked into electric scooters ? 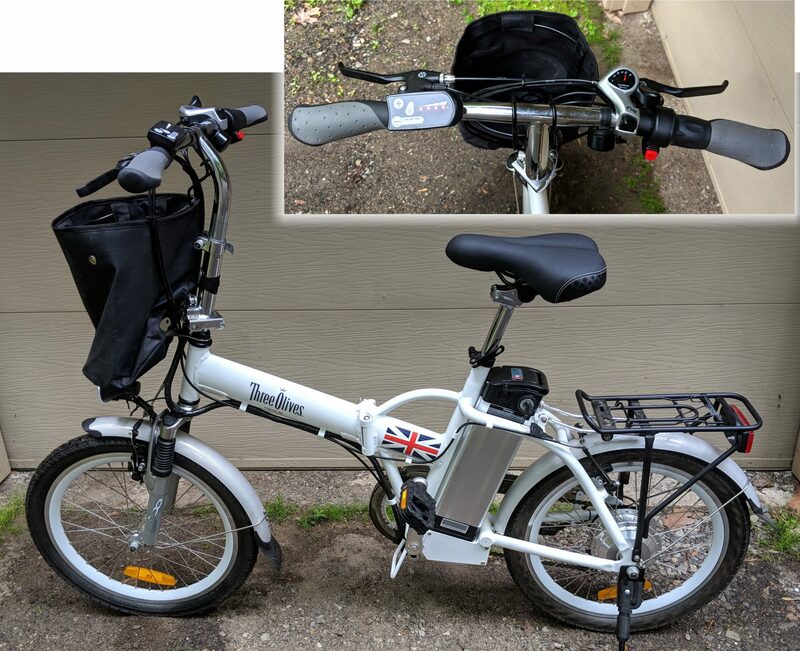 I have an electric bike and folding and storing it was a pain. It’s also cumbersome to carry on board. I discovered an outstanding E-scooter. One that folds into a very small package about the size of a small guitar and light enough that almost anyone can carry , slide in/out battery makes it even lighter. Range is about the same as my E-bike. Sorry but this defeats the entire purpose of having a bike, EXERCISE! If you spend lots of time aboard you need to pedal an actual bike for your cardio.